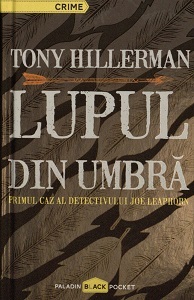 This is the first Romanian hardcover edition of Tony Hillerman's first novel, The Blessing Way . The Romanian translation is by Lena Schultz, and it was published by Editura Publishing House (Editura Paladin) in 2016 in Bucureşti. A Romanian translation from English and notes by Stefan and Cristina Ghidoveanu. This is a hardcover edition edited by Ela-evelina Jianu and Iulia Pomagă, corrected by Theodor Zamfir, designed by Cristian Vlad and Mihaela Aramă, and covered by Alexandru Daș. The front cover is designed with a orange yellow between the title and the author and grey feathers with dark grey background. Synopsis and summarized book reviews are in the back cover. Medium blue boards with author's name, title and publisher printed in black on the spine.